Isn’t that the fruity designery thing designers do? Except they do it before they actually do anything, I think. Anyway, I wish you could feel this swatch of full grain semi-aniline leather in “Austin Dark Olive” I just got. Yum. I think the hair stood up on the back of my neck when I pulled it out of the envelope. The Italian leather samples I got with it are practically imitation in comparison. Now: Do I cover the doors in it, or the desk? 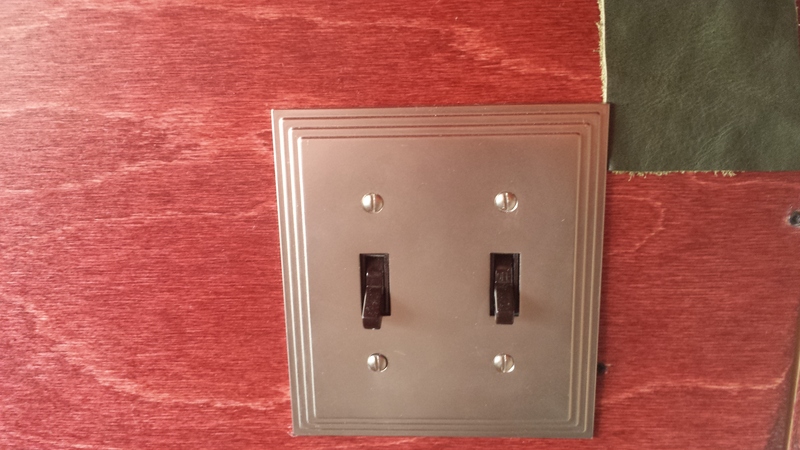 Front sconce lamp shades (top left of the switch plate here) go without saying! You ever notice how almost everything rich and delicious and luxurious is brown?